When Leyla Gursakarya found out she was expecting twins, she knew she was in for a roller coaster ride. Read about how she experienced breastfeeding twins, and her tips on how to manage. “I can hear a heartbeat, oh wait I can hear two heartbeats.” When the doctor said this to us, we knew we had got ourselves on a roller coaster adventure ride. I was in total shock for two days before getting used to the idea of becoming a mother of twins. I had a difficult pregnancy with bleeding and risk of miscarriage leading up to the window of giving birth prematurely. So basically I was a pregnant couch potato with too much time to read everything about parenting twins. However the biggest question mark was how to breastfeed twins. My twin girls were born in week 35 weighing 5lbs, 4oz (2.4 kg) and 5lbs, 11oz (2.6 kg). During the first few weeks I had to feed them every two hours until they gained enough weight to feed every three hours. I used a double breast pump to express milk. This helped to build up a good milk supply and enabled me to bottle feed them both with breast milk simultaneously. 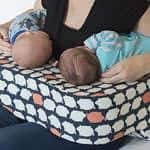 As they were inevitably hungry at the same time – this is quite a challenge when you try to manage on your own – I would put 45 degree pillows on both sides of my body, so the babies’ heads would be higher than their tummies. That prevented gas problems and tummy aches. I admire mothers who breastfeed their twins simultaneously. I’ve watched many breastfeeding twin mums on YouTube. I have personally tried all kinds of positions, but nothing worked for me. Especially with newborns that need extra help with latching, meaning you need two hands per baby. So picture me sitting on my bed with a breastfeeding pillow around me and some pillows behind my back. I would then position the most hungry baby onto the pillow and let her drink from one breast. While placing her sister in a position to feed, the drinking baby would then roll off the pillow. I just wanted as many arms as an octopus. Deep respect for the mums who managed to do this! A breast pump is one of the weirdest objects I have used on a daily basis. Also the sound of it started to hypnotize me in an annoying way. After a few minutes my pump started talking to me! It would say: “Wake up”, well more like “Waaaaake up, Waaaaake up” (say this with a robot voice and you will know what I mean). My sleep deprived brain made me believe it. So as soon as I was done breastfeeding, I threw it in the bin like a basketball hitting the basket. Nobody said it was easy and it really isn’t. 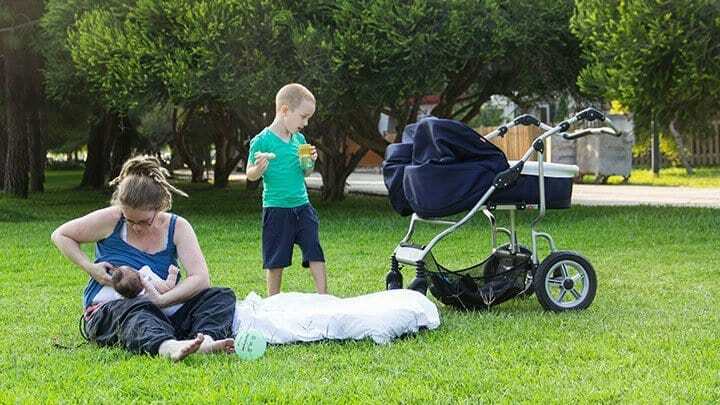 Being a mom of 3, I learned that every baby is an individual with different needs. 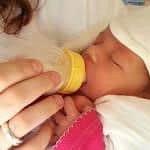 No matter what choice you make, breast milk, expressed milk or formula milk, or a combination, as I did. You make that choice because that’s what you think is best for you and your babies. 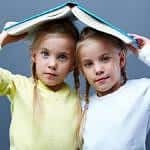 I love being a mum of twins, and I hope that my experiences will help you to get you through a beautiful and precious, but chaotic time, that comes with parenting twins. Invest in a good quality double breast pump. Make sure you have good pillow support for you and your babies. Look for a large breastfeeding pillow and 45 degree pillows for bottle feeding. Don’t stress out if you don’t manage to breastfeed them both at the same time. Find out what works best for you.